It’s Chark here today with the fun job of announcing our March Challenge Winner and our special Comment Winner from March. As always, we love seeing what you come up with during the month to fit the theme and the March “Playing With Stencils” challenge was no different. Our runners-up, who get bragging rights and a blog button when they contact us at the above address, are three talented ladies. This challenge was a close-call and you can see why when you take a look at these projects. Look at what Verna entered this month—this colorful flower and butterfly combo card…isn’t this just the very picture of Spring? Next up is Maura with her bright version of the Color Layering Peacock stamps. The added bits, including black delicate branches and the yellow enamel dots on the tail made this one a top fave with our design team. Our third talented cardmaker is Monika with a gold and black beauty that is striking and elegant. The little gold dots and the gold strip of paper really frame the gold stenciling on this. March 31, 2017 at 10:25 am Love that big, bold flower in a coffee cup – what fun!! Email us at the above address, Maura, to get your gift code! Congrats to our winners and thanks for stopping by today! Don’t forget, we have a brand-new challenge for April and you can enter a project to try to win a $25 gift code to the a2z Scrapbooking store. The theme is Getting to Know You and we’d like to see your favorite Hero Arts product (stamp, stencil, die, inks, digi, etc.) on your project. Categories: Challenge Winners, Handmade Cards, winners | Tags: march 2017, march winners, Winner, winners | Permalink. Hello everyone!! Kymona here, stopping by to announce the winner of the Baby Footprint Necklace. Congrats Tristan!! Thank you so much for visiting and leaving a comment. I truly appreciate it. I will get your necklace to you ASAP. Thank you to all of you who stopped by and left a comment. You ladies make my day. Don’t forget to play along with our challenge this month, the theme is Anything Goes!! Just use at least one Hero Arts product!! I can’t wait to see what everyone comes up with. Categories: winners | Tags: giveaway, necklace, Winner | Permalink. Hi, friends! Today I have some color layering stamping to share. But this time, I’m stamping on wood and not paper. These wood tags are meant for mason jar labeling (I found them at the craft store) but I’ve used them to make a keychain and an ornament. Distress Inks seem to work the best on the wood, with little feathering of the ink. I stamped both projects with the Color Layering Cardinal Stamp Set. I used Distress Ink in Candy Apple and Mowed Lawn, Black Staz-On ink and Strawberry Hybrid Ink. Fast and easy and perfect for adding to a present or for an ornament exchange. You could add the year on the back or a name with stickers or marker. I stamped the keychain with the mini flowers with this stamp set, using Distress Inks in Mowed Lawn, Candy Apple and Vintage Photo. Again, easy and fast to make and give. I think it’d be wise to spray a fixative on this if you’re worried about it getting wet. As you know, Distress Inks react with water. Christi Steinbeck!!! You get $25 to the a2z store to spend as you like. Don’t forget to join in this month’s challenge, Layer It, to try to win your very own $25 gift code to the store. Categories: color layering, Gifts & Gift Wrap, giveaway, Handmade Cards, Mixed Media | Tags: cardinal, chark, color layering, color layering cardinal, Gifts, kechain, ornament, Winner | Permalink. First, the winners. I have the pleasure of announcing the winners from the CASEing Kelly Blog Hop from last week. Congratulations to Charlene and Leslee who are receiving prizes from us and Congratulations to Vinita Jain, who commented on our blog and will receive the prize from Altenew and all the winners from the hop. Thanks for hopping along to celebrate our friend, Kelly Latevola! That’s the Winner part of the post…the Winning part is that Jennifer McGuire is starting a fabulous challenge called Share the Handmade Kindness Challenge. The details are on Jennifer’s blog and it’s an entire month of sharing and caring and passing on kindness to others. What could be better—crafting for the purpose of passing along kindness? You have fun and do good in the world and that, my friends, is winning in my book. 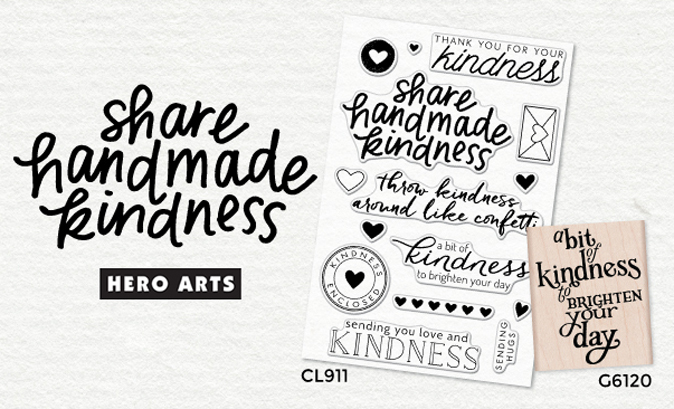 To support the Share Handmade Kindness Challenge, Hero Arts has created two stamps with messages of kindness. They are donating 25% of the profits to the Kind Campaign to help end bullying. Jennifer helped to make these stamps and she is excited to know Hero Arts is supporting her cause, and we are too! These stamps are fabulous and you can get them through our store right now (they ship Friday). 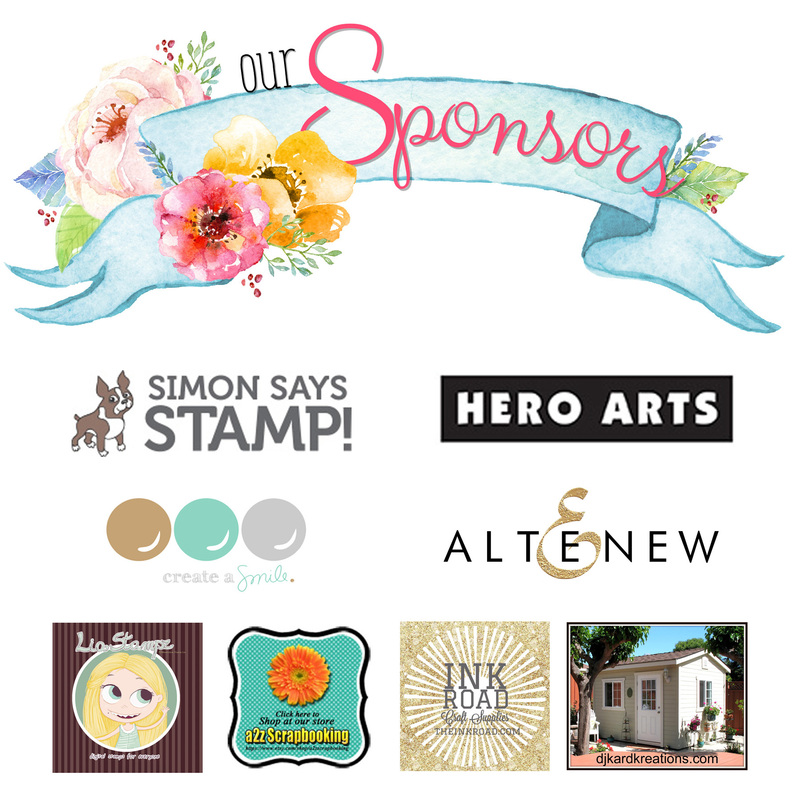 If you order them (or any products) through a2z Scrapbooking Supplies, your purchase also benefits Camp Gluten Free (for children with gluten allergies) and supports people with Behcet’s Disease. So, really, you’re doing all kinds of good in the world! So excited to see what everyone comes up with during Jennifer’s challenge month…and to see the creative projects that will happen with these stamps. Please jump over to our Facebook page and post your projects made with them so we can all enjoy them! Ok, people, let’s go out there and be kind! p.s. We’ll be announcing our September and October challenge winners very soon! Stay tuned! Categories: Handmade Cards | Tags: blog hop winners, jennifer mcguire, kindness, kindness challenge, kindness stamps, Winner, winners | Permalink. Hello everyone!! I’m jumping in here to announce the winner for our Clean and Simple Challenge!! Your card is classic clean and simple!! C is for clean: There is a lot of white space with a pop of color. S is for simple: Your flower and sentiment is super easy to replicate. There for your Clean and Simple!! Our August Challenge is currently going on. It ends August 31st. The theme is Texture! I hope to see you there!! Categories: Challenge Winners, Clean and Simple | Tags: butterflies, circles, clean and simple, Flowers, white space, Winner | Permalink. It’s Lisa here, and I’m delighted to be here this evening to post the WINNERS of our October Challenge. Please accept our apologies for the delay – our DT Coordinator, Michelle has been feeling a bit under the weather, which is why we are a tiny bit late. As we all know, sometimes life and illness gets in the way and that’s exactly what happened this month for us! We wish Michelle well and hope she’ll be on the mend very quickly. This is also the second post of the day and we held off to the evening so that everyone could see the fabulous projects that Barbara shared with us in her post this morning. If you missed it earlier, please scroll down to the next post and check it out — Awesome work Barb~~ — I love everything you shared and want to be sure that no one misses out on your wonderful projects. I have to admit that it’s NEVER an easy task to pick our Winners, especially with so many wonderful cards entered in our challenge. I am very thankful to my Mom and Hubby, who were here to help me choose this month’s Winners!! We each picked out four projects that we ALL loved. I then put each of those entry numbers into a “bowl” and we then drew the winners from those choices. It was way to difficult for me to simply pick the winners, so this idea of drawing a winner seemed liked a great solution. You all Rock and I’m so happy you all joined us ! I hope you are all also playing in our current “November Challenge” for another chance to WIN! And now, without further ado it’s time to make the winners announcement — Drum Roll Please…..!! Our FIRST PLACE WINNER and the winner of a $25.00 Gift Certificate to the a2z Scrapbooking Store is “LaVon” and this is her wonderful card, which I just LOVE!! Congratulations LaVon — Please email Linda at a2zScrapbooking@combast.net to claim your prize. She will be looking forward to hearing from you — Happy Shopping and thank you for playing. Next, I have three fabulous cards that were picked as our Honorable Mention entries for the October Challenge! I’m happily sharing these next, starting with this first beauty by Betty. This is a stunning Fall inspired card — the design is fabulous and the leaves, look so real. Fantastic work by Betty. And our next Honorable Mention is Andrea with this lovely card, which is just one of the four wonderful cards she entered in our October Challenge! Thank You Andrea for sharing these amazing cards and for being such a great player! And our third Honorable Mention card for this month is this super sweet Winter themed card created by Kimberly Wiener. Not only do I love this Hero Sentiment stamp, but I loved the adorable scene she created! So talented. WooHOO! I truly love all these cards and will be very excited to see your new Badges on your blogs. Please email Linda, at a2zScrapbooking.comcast.net for your Blog Badges — Thanks so much to each of you for taking part in the challenge. We will look forward to seeing what you create to share with us in the latest challenge. Thanks again for stopping by and Congratulations to each of our lucky and very talented Winners!! Categories: Challenges | Tags: Black Friday, Challenges, Prize, Sale, Winner | Permalink.